Coached the most #1 tennis players in the history of the game. Sitting in the stands watching my student Maria Sharapova win in the 2004 Wimbledon final, I recall thinking, "All the years, all the intense work, all the dreams." Maria was about to realize her lifelong ambition. Not a lot of people get to hold up the championship trophy and reach the highest level of their profession. I have coached some of the greatest tennis players in the history of the game: Pete Sampras, Lindsay Davenport, Tracy Austin, and Maria Sharapova, to name a few. Many have won Grand Slam events and been ranked number one in the world. How did they reach their dreams? Eric and I go back some 30 years. I coached him for several years and watched him work his way on to the professional ATP tour. He was not the biggest, not the fastest, but I will say he was talented, disciplined, and mentally tough. When his career ended and he started teaching tennis, that made sense. Eric was always a student of the game with a keen eye and an easygoing personality. When I heard he was trying to become a professional musician I was a little bit shocked. Who does that? He started playing tennis when he was five—after their careers, most tennis pros start teaching or get involved in some sort of business. Rarely do they engage in another endeavor that takes countless years to master. When I was asked about the “get-the-best-athlete” approach that now seems to be the rage, I was skeptical and then offered this anecdote: There was a group of athletic girls who gathered for a drill, and one was the fastest girl in the school—a track star. In the drill of running to the baseline and touching the net when the word “go” was given, she won. But the girl who finished second in that race finished ahead of the track star when it came to chasing down a drop shot. So, obviously there is more to being a good tennis player than just being a great athlete. It takes heart and guts. This is one thing Eric has always had, and something that this motivating and enlightening book has. Lots of HEART AND GUTS! After his career, Eric had his dream of music and nothing was going to stop him from achieving it. He worked hard and didn’t give up. He believed in himself and had the qualities needed so that people around him started to believe, too. Yes, Eric has an incredibly successful tennis coaching career but equally impressive he is also an amazing musician and motivational speaker. I think what makes him a great teacher is his expansive knowledge, gift for seeing each student individually, and utilizing his unique mind to develop this amazing tennis system. 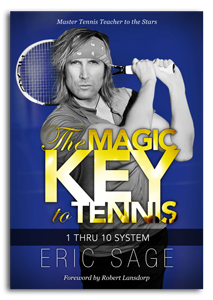 In this book, Eric not only teaches topspin, mental toughness, and shot selection, but also answers that elusive question: How to become great and reach your dreams? This book should be read by anyone who wants to play great tennis, understand the importance of not giving up, and learn how to be successful - in tennis and in life. It is a pleasure to know Eric.